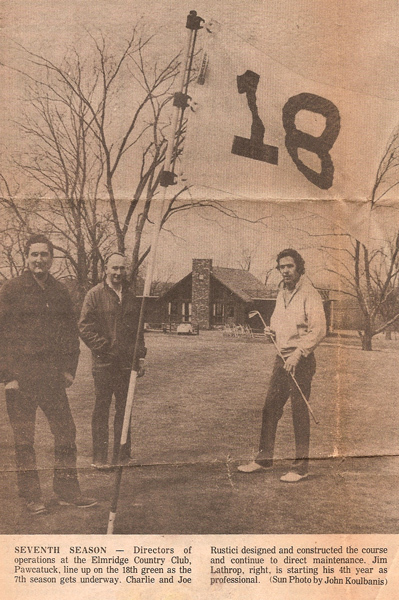 Elmridge Golf Course was designed and built by Joseph and Charles Rustici, and opened for play in 1966. Like many courses in the area, the property was formerly used as a dairy farm, and a 40 ft. tall grain silo can still be found directly behind the first tee on the white course. Originally opened with only 9 holes, the course later expanded to a full 18 holes, and eventually to its current 27 hole configuration. Covering over 250 acres, the property is graced with numerous ornamental plantings, sweeping views to the west, and cooling breezes in the summer, due to its proximity to Long Island Sound.